Scientists at the University of Cincinnati have created a new type of display that promises full colour ebook readers that are as bright and colourful as magazines. The new electrofluidic display (EFD) technology uses pixels that can hide or display brilliantly coloured pigments without the need for a power-sapping backlight. "If you compare this technology to what's been developed previously, there's no comparison," says Jason Heikenfeld, Assistant Professor of electrical engineering. "We're ahead by a wide margin in critical categories such as brightness, colour saturation and video speed." The electrofluidic display is composed of two thin sheets of plastic: one composed of etched pixels that contain a small pigment-filled reservoir (just 5 per cent of the area of the pixel); the other is a transparent electrode. When a voltage is applied to the pixel, the coloured pigment is forced up and out of the reservoir to become visible. Pixels are small (around 300 micrometres), allowing high resolution displays, and early prototypes can already manage a fast enough refresh rate to show basic video clips. The researchers claim that producing a screen with a reflectance of over 80 per cent will be 'fairly straightforward', and also say that EFD screens are potentially bistable - retaining their image even with no power applied - which is a crucial feature of any e-book reader. Their paper, published in Nature Photonics, says that EFD can enable a full colour e-book reader display with a white state brightness that is 50 per cent better than Amazon's Kindle. Because of the EFD's slim dimensions (15 microns) and no need for a backlight, the scientists say it could be ideal for foldable displays, electronic windows and even colour-changing casings on portable electronics. 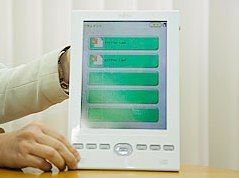 Fujitsu has just released its colour FLEPia ebook reader, which uses an electrophoretic e-ink display.